Seeing them together on screen is not surprising anymore but the manner of how they portray their characters have grown. They just announced this is Grades B by the Cinema Board. 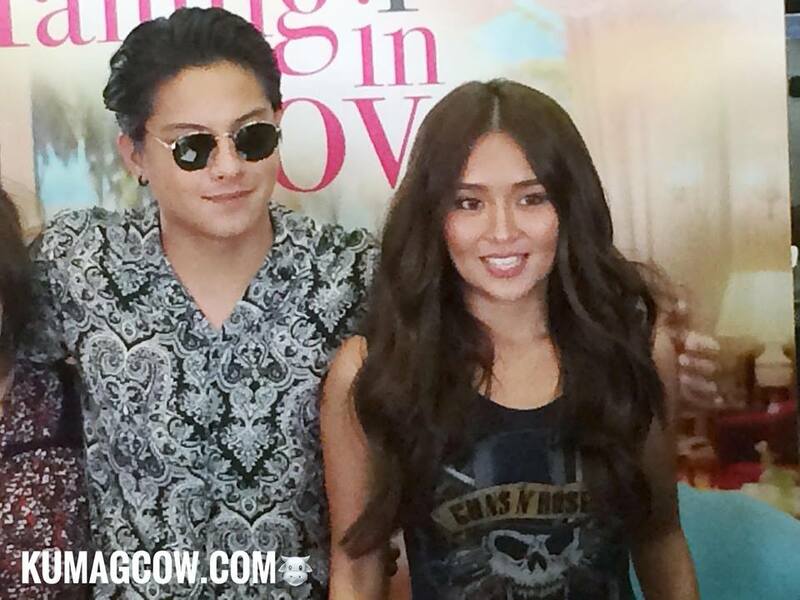 Kathryn looks so gorgeous, sunkissed, while DJ is more masculine, as if he's turning to a more mature Padilla as you can see with his stance. Kath says "If you see our characters, you'll laugh at us because we're doing comedy too. It's not the usual KathNiel, it comes with age I guess even though there is no effort. If there would be some dialogue that would be a wee bit uncomfortable, they are open to do what I suggest more so if it would look more natural. It's an advantage to see different personas, different characters, and the director spots when we actually are doing our other characters from other projects, hopefully you'll see a different woman on Saturday when it shows on theaters. Much different from Barcelona. 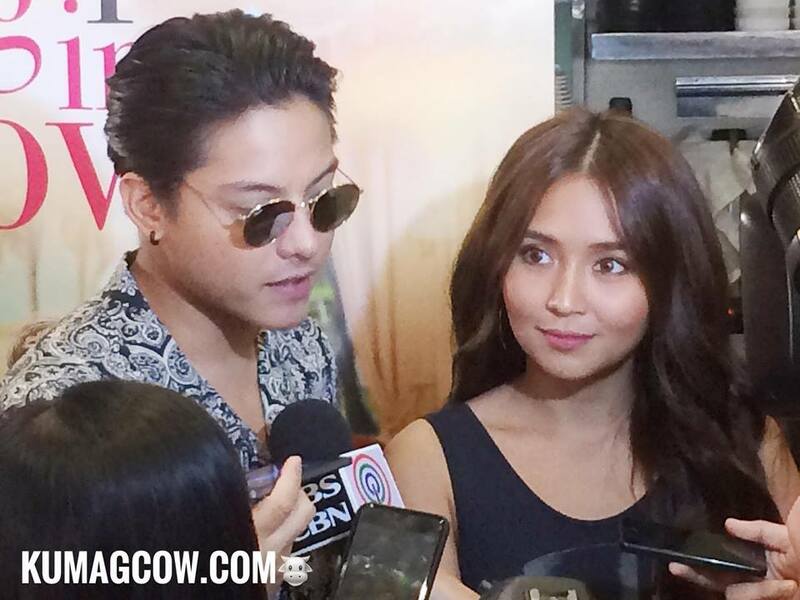 I also like the fact that everyone is so happy for us, everything is so smooth, KathNiel is so happy too because we don't go out alone, we usually go out in groups because that's good and we don't want to do anything that would hurt our parents and hopefully gain their trust. The hardest thing is how to get along and I see DJ is doing that, it's what is important to me. They always know when something is wrong, we can't hide that and people know, people get affected too so we talk. I often don't talk to him when that happens but work makes it impossible not to talk about it. We need to patch things, even if scenes require us to fight, we really fight and it's normal, but now how we handle it is more mature. Dj is not that jealous, he's more chill now. Relaxed." 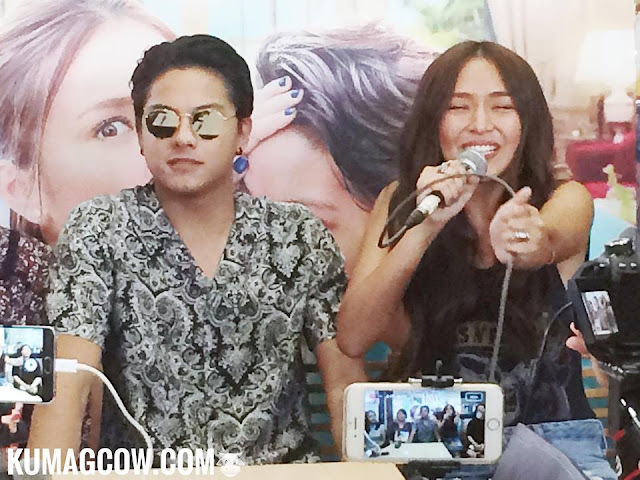 Daniel adds "Kathryn is always with her PA before but now she's so independent. She's well adjusted, and decision making is always hers. We are so blessed that we have several good things going for us, this movie, the mall shows, and we see they are excited because even if we're tired, seeing them alone makes us so thankful we're here! When Dos comes out of the story, you'll see how he's different from me, he's very naughty, and we talk about it before a scene so we take great pleasure with what pur Assistant Director does when we're already down and low. He's the life of the party. Mom always knows so she always asks for us to talk, and always know what to say at the right time. If ever there are problems, we just don't talk, but it's different reasons and we just need to think sometimes, make her guilty a bit but talk to her after that." The writers say Gab is total opposite with her character and we're playing with it, so if you watch it you'll see how Kathryn gave her all in Gab's persona. Dj has always been an old soul and they say the man has some wisdom, very quiet sometimes but he thinks about it. When they were shooting the film, the writers were so happy that Kathryn and Dj were not at all hesitant, the procedures were very collaborative. They talk and the characters evolve because they add in their take on the role, they consider their opinions on scenes and the Director just filters it if they are going off the character. It's been like that in previous projects too. They are very trusting actors and the Director really appreciates that. Can't Help Falling In Love will be seen on 300 cinemas on Black Saturday, go out and watch with your family and make history, try to make this the biggest Star Cinema opening gross please!